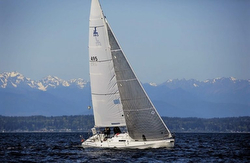 (Seattle, WA)- Hosted by Corinthian YC Seattle and J/Boats Northwest, the 2018 edition of J/FEST Northwest was a great success for the forty-seven teams that participated in the two-day regatta. Racing took place for a PHRF class and one-design for J/24s, J/80s, J/97E’s, J/105s, and J/109s. There was no question the Saturday evening dinner and extravaganza took its toll on some of the crews, a number of them waking up a bit “foggy” on Sunday morning. Most classes had at least three races, and others up to five in total. The eight-boat PHRF Division had an eclectic mix of J’s from across the design spectrum of time. In the end, it was twin J/30s leading the way! Winning was Jim Bottles’ CELEBRATION with a 1-1-2 for 4 pts, followed by Cindy Gossett’s OUTLAW with a 2-2-1 for 5 pts. Seems to have been a nip-and-tuck battle between them all weekend-long. Third was Jamie Thomas & Kyle Caldwell’s J/44 ASYLUM. There was a surprising win in the eleven-boat J/24 class. Taking the honors was Lydia Volberding’s JAILBREAK with a remarkably consistent 1-3-3-3-1 for 11 pts total. The balance of the podium was determined by a tie-breaker on 18 pts each- taking second was Jacob Lichtenberg’s HAIR OF THE DOG with a 9-1-4-1-3 over Scott Milne’s TREMENDOUS SLOUCH with a 2-8-1-2-5. It was another very close battle for the top of the leaderboard in the eight-boat J/80 class. In the end, it was a classic “last race/ last leg” that determined the ultimate outcome. Taking the class win was Bryan Rhodes’ CRAZY IVAN with a 1-7-1-1-2 for 12 pts total. Second was Emre Sezer’s RECKLESS with a consistent 2-4-2-2-3 for 13 pts. Third was Phil Dean’s RUSH with a 6-3-3-3-1 for 16 pts. Rocky Smith’s INDIGO HORIZONTAL dominated the J/97E class with straight bullets. Following in second was Scott McConnell’s ROCKET J SQUIRREL and third was Eric Barlow’s IRIE. The always-popular J/105 class of eleven teams saw a familiar face at the top of the podium- Chris Phoenix’s JADED winning with a 2-1-3-3-1 for 10 pts. Grabbing the silver were the “Soupers” from Portland- Eric Hopper, Matt Davis, Doug Schenk’s FREE BOWL OF SOUP- posting a respectable 3-2-4-2-2 for 13 pts. Third just one point back was Jerry Diercks’ DELIRIUM with a 5-3-2-1-3 for 14 pts. Two locally famous names in the local PNW circuit rounded out the top five- Jim Geros’ LAST TANGO in 4th and Tom Kerr’s CORVO 105 in 5th. Winning the Pacific NW J/109 Championship Trophy was Stu Burnell’s TANTIVY with a complete blitzkrieg of the fleet, posting just five bullets for a massive total of only 5 pts. Ouch. Jerry Woodfield’s SHADA nearly pulled off a win, but had to hang tough just to get the silver by a mere one point with a 4-4-2-2-2 tally for 14 pts. Third was Tolga Cezik’s LODOS with a reasonably consistent record of 2-2-3-5-3 for 15 pts. For more J/Fest Northwest Regatta sailing information Add to Flipboard Magazine.